The aim of this paper is to give a concise overview of kernels, with a special attention to non-standard or heterogeneous data sources (e.g. non-numerical or structured data). A second goal is to discuss the world of possibilities that kernel design opens for the principled analysis of special or new application domains. The reader is referred to some of the excellent survey publications -as [1, 2, 3]- for an in-depth coverage. Belanche, Ll. 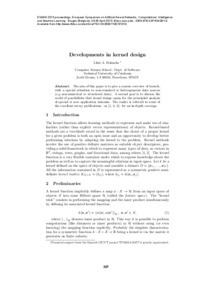 Developments in kernel design. A: European Symposium on Artificial Neural Networks, Computational Intelligence and Machine Learning. "ESANN 2013 proceedings: European Symposium on Artificial Neural Networks, Computational Intelligence and Machine Learning: Bruges (Belgium), 24-26 April 2013". Bruges: 2013, p. 369-378.